Russia and NATO fighter aircraft will take part in the first ever joint exercise during the upcoming Vigilant Skies 2011 anti-terrorism drill to run between June 6-10, Russian National Antiterrorism Committee spokesman Nikolai Sintsov said. 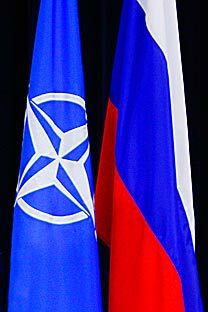 This is the first such counterterrorism exercise held between NATO and the Russian Federation, Sintsov said, adding that it will be held as a part of "the NATO-Russia Council Cooperative Airspace Initiative." "This initiative is designed to prevent terrorist attacks which use civilian aircraft, such as the attacks on the World Trade Center on September 11, 2001, by sharing information on movements in NATO airspace and Russian airspace, and by coordinating interceptions of renegade aircraft," a press release on NATO's webpage said. The exercise will help improve air safety for passengers on international flights between NATO and Russian airspace and those living on the ground, Sintsov added. The new airspace security system provides a shared NATO-Russia radar picture of air traffic and allows early warning of suspicious air activities through commonly agreed procedures. The implementation of the drill will help to increase Russia-NATO counterterrorism capabilities, bring transparency and predictability to the situation in the air, as well as bolster cooperation and understanding between the participating countries. The drill will be a major milestone in making the NATO-Russia Council Cooperative Airspace Initiative system operational.